We’ve reached the end of our free 30-day home organizing series, and now it’s time to talk about staying decluttered. You didn’t put in all of this work just to watch it fall apart, did you? If you’ve not followed the program to this point, here’s the series overview with links to previous days’ missions. We have been learning to ROCK our homes, which is our nifty little way to remember how to deal with clutter in your home. So now, let’s talk about how to ROCK on from here. So often when we think of following a routine, we think of being in a rut, living like an automaton and never really having any fun. When it comes to staying decluttered, though, the exact opposite is true! Following a routine around the house keeps you ahead of clutter and mess. 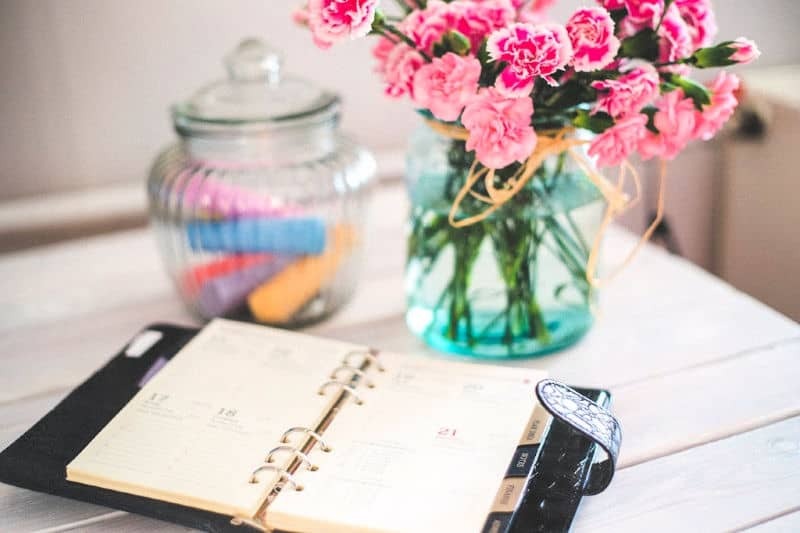 Rather than continually reacting to problems around the house, a routine allows you to prevent them from becoming problems in the first place. And that means you experience less stress and frustration, so you’ve got more time and energy to have fun and enjoy life. The schedule below covers two weeks of staying decluttered, but includes a weekly cleaning day as well as a day to do nothing at all. But beware of burning out: even the best routine will begin to feel like a slog if you don’t take rest days. So, don’t skip them! This schedule focuses on staying decluttered, which is not the same thing as cleaning. An uncluttered home will always look cleaner than a disorganized one, but a clean home isn’t necessarily one that’s clutter-free. It’s just cleaner. If you want to follow routines for staying decluttered and clean, I suggest combining the schedule below with my Daily Cleaning Routine. Do you have to take a day off or do your cleaning all on one day? Of course not. As I said at the beginning of this series, it’s important to find a pace that suits YOU. Need help figuring out how to do that? Pick up a copy of my book Cleaning on YOUR Schedule. 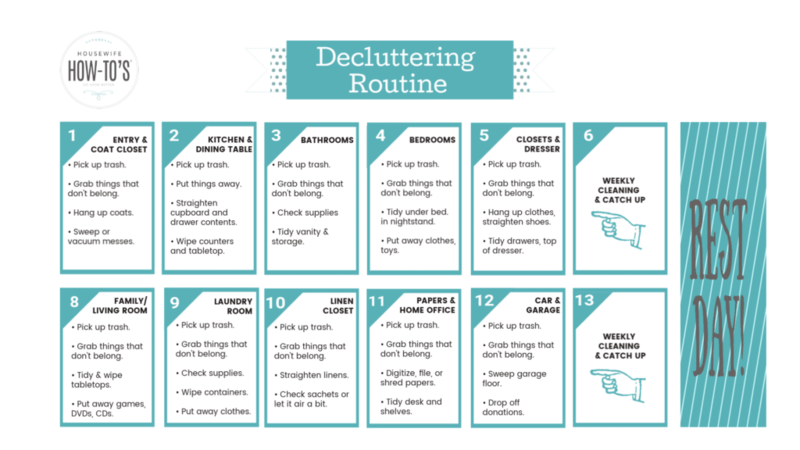 Click the image below to open the staying decluttered routine in a new window for printing, or right-click to save it to your device. 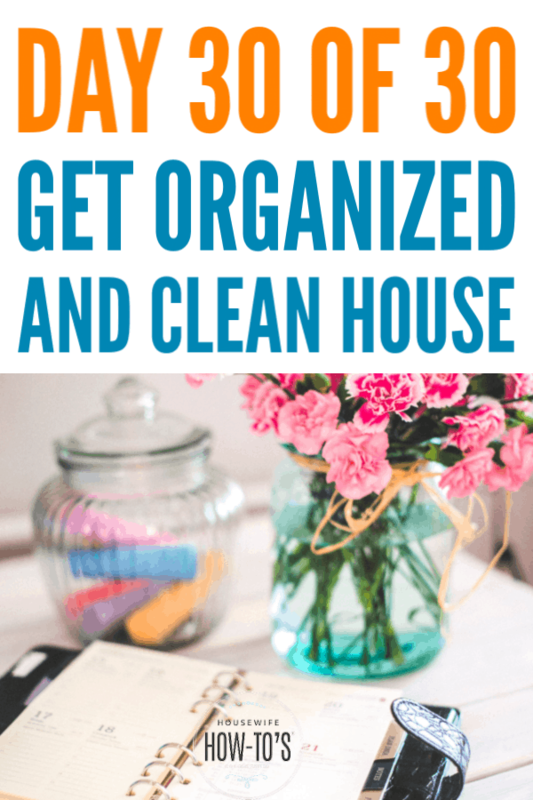 So, there you have it: a free 30-day home organization series to help you get your home organized and clean, plus a schedule about staying decluttered in minutes per day.